November 17, 2017 -- A 3D image reconstruction technique can combine functional and anatomical heart data, enabling practical descriptions of scarred tissue from cardiac anomalies revealed by electrocardiography (ECG), according to research presented at the recent European Society of Cardiovascular Radiology (ESCR) in Milan. Significantly, the technique provides for the simultaneous assessment of left ventricle structural and electrophysiological properties, noted lead author Dr. Sergey Ternovoy, PhD, head of the tomography department at the National Medical Research Center of Cardiology in Moscow. He believes the method may enhance planning of ablation procedures. 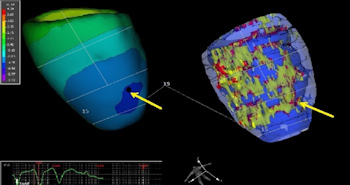 In most patients with prior myocardial infarction (MI), ventricular arrhythmias may originate from zones of low gradient echo (LGE) on MRI, and having data about the structure of the left ventricle in the planned site of ablation may improve the safety of the procedure. A 3D map of left ventricle. The epicardial and endocardial surfaces of healthy myocardium are marked blue. The zone of infarction has a heterogenic structure. The scar tissue is marked red, and is surrounded by gray zone, which is marked yellow. All images courtesy of Dr. Sergey Ternovoy, PhD. "Left ventricle (LV) structural changes -- scar tissue and gray zones -- are the substrate for development of ventricular arrhythmias (VAs). Estimation of the spatial relations between the LV structural changes and location of VAs is the aim of the study," he explained. The group enrolled 25 men (mean age 61 ± 9.4 years, age range 49 to 70) with prior myocardial infarction. They underwent 24-hour ECG monitoring, and body surface electroanatomical activation mapping was carried out, along with reconstruction of LV 3D models to locate the VA origin using the group's own specific software LGE Heart Analyzer (which has a Russian Federation patent) in combination with CardioVis 3D. On these maps the location of VA origin was detected as a point of earliest electrical activation. LGE MRI was performed on a 1.5-tesla clinical scanner using high resolution (1.25 x 1.25 x 2.5 mm) inversion-recovery pulse sequence (TI 290 to 340 ms, TE 2.4 ms, TR 750 to 950 ms). On the images, LV myocardium epicardial end endocardial surface were segmented manually. Scar tissue threshold was 3.5 SD above the mean LV signal intensity (SI), and gray zone threshold was 2.5 to 3.5 SD above the mean LV SI. 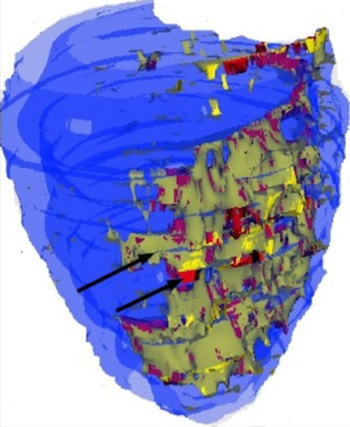 Scar and gray zone were mapped on reconstructed 3D models of LV structure. "Both 3D models of LV structure and LV electroanatomical maps were divided into 17 segments manually," the authors explained. "These 3D models were evaluated simultaneously by two experts: a radiologist and an electrophysiologist. The relations between location of VA in comparison with the LV myocardial structure were assessed." The 3D elecroanatomic map (left) and 3D structure map of the left ventricle. On both maps, the division into 17 segments is performed. The origin of ventricular arrhythmia is shown by the yellow arrow. The origin of ventricular arrhythmia is located in the area where scar tissue, gray zone, and healthy myocardium come together. The extent of scar tissue was 7.7%, and the extent of gray zone was 7.3%. The infarct zone had heterogenic structure, while the scar zone was mosaic and surrounded by regions of gray zone. In 73% of cases (18 patients), VA origin was the zone of enhancement. In most cases the location of VA was the endocardial surface of LV (14 patients). At the same time, four patients had epicardial origin of VA. No relations between the depth of LV damage (enhancement transmurality) and the origin of VA was estimated. Data regarding the structure of LV in the location of VA may be helpful for planning ablation, the authors added. The thickness and structure of LV myocardium in the planned ablation site may provide an opportunity to use optimal energy and decrease the risk of pericardial effusion of the hemopericardium. In an email to AuntMinnieEurope.com, Dr. Sergey Morozov, PhD, CEO and professor at the Research and Practice Center of Medical Radiology in Moscow, said the paper presents an example of the successful combination of functional and anatomic data, obtained by physiologic data analysis and imaging. "This approach allows detailed description of scarred tissue at the sites of electric anomalies revealed by ECG," he wrote in the email. "Multimodal assessment leverages the value of imaging and physiology data, demonstrating that 1+1 > 2. The approach also increases the value of a radiologist in a multidisciplinary patient-centered clinical team." The co-authors of the study included Dr. Olga Stukalova, PhD, a cardiac radiologist at the National Medical Research Center of Cardiology, and Dr. Olga Aparina, PhD, a cardiologist and research fellow in the Clinical Electrophysiology Department of the same facility. The scientific posters from the ESCR 2017 meeting are available in the European Society of Radiology's EPOS database. To view the exhibit by Ternovoy and colleagues, click here. Trayanova NA, Pashakhanloo F, Wu KC, Halperin HR. Imaging-Based Simulations for Predicting Sudden Death and Guiding Ventricular Tachycardia Ablation. Circulation: Arrhythmia and Electrophysiology, 10 July 2017. Do DH, Boyle NG. MRI in patients with implanted devices: Current Controversies. American College of Cardiology, 1 August 2016.